Welcome to LamboWeb's home page. This site was originally created by fellow Lamborghini enthusitest and owner John Monahan. For years his site has serves 100's of do-it-yourselfers and Lamborghini owners alike. I reffered many friends and customers to John's site over the years until I learn last year a domain vulture (someone who grabs domain names as soon as they are not re-registered and then extores money to buy them back) I, along with many other fans of the site were devistated not to have this resource around. With John wanting to "retire" from maintining the site and the vulture sealing the domain, I worked diligently to purchase the name back, get a copy of the entire website from John to host the site on our servers. I hope to be able to continue the tradition of his site and welcome anyone with time to assit or make suggestions as I look to refresh the site and update it. This web site is setup for people who own or are interested in Lamborghini cars. Particular focus will be given to recent cars, the Countach, Diablo, Murciélago and Gallardo models. No attempt is made to be a complete site for all things Lamborghini, rather the web site will focus on Lamborghini news events, input via forums and repair suggestions from users like you. Please pass the word on to friends. Lamborghini made many cars in small numbers over the years. Only a few of these would be recognized by the general public. In the early years these included such as the 350 GT and GTS, and the 400 GT 2+2. These were all cars of the early to mid 60's. The car that more or less put Lamborghini on the map was the P400 Miura. It was first shown on November 1965 at the Turin Auto Show by Ferruccio Lamborghini who astonished everybody with this car, only the chassis was shown at the show, the engine was transversely mid-mounted, something up to then only seen in real F1 race cars. The design of the body was executed by Marcello Gandini in less than a year, and on the March 1966 Geneva Show it was completed and on display. It looked even better than in Turin. The car was very aggressively styled, and an appropriate name was chosen for it, the Miura, a name taken from the ferocious Spanish fighting bulls. In 1982 the Countach 500S came out. It had a 4.75L engine and was fitted with a new electronic ignition system. Total horsepower however did not really improve that much remaining at about 375 HP. Approximately 320 LP500S's were manufactured. 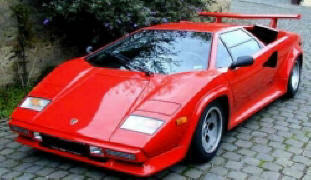 In 1988 the final version of the now "long in the tooth" Countach was put on the market. It was called the Countach 25th Anniversary model or the "Anniversary model". The bodywork was modified to include enlarged engine air intakes and the side skirts were further exaggerated. Engine power (still 4.17L), remained around 455 HP. Approximately 657 Anniversary models were manufactured. The Diablo was presented to the public on January 21st 1990, at the Hotel de Paris in Monte Carlo. The design was the result of 5 years of work between Lamborghini and Chrysler Corp. who owned Lamborghini at that time. There was lots of discussions in getting both sides to agree on this design. Representing Lamborghini was Marcello Gandini, he also designed the Miura and Countach, so he was the obvious person to design the new Lamborghini, but his initial design was altered, first under his own directions, then under Chrysler. In the end he did put his name on this outstanding car. In fact his signature can be seen on a the right hand side of each Diablo in front of the rear wheel. The Diablo was still a true Lamborghini, low, wide and extremely fast, its top speed being about 210 MPH. The engine was a major upgrade on the Countach V12. The displacement was now 5.7 liters (4 valves/cylinder) and a newly developed "multi-point" fuel injection system was introduced. This electronic system has been developed by Lamborghini. The engine itself could pump out as much as 492 bhp with this new "LMI" system. In general the care was more refined than the Countach. Gone were the big air intakes. They were now neatly incorporated in the overall design. The air conditioner and heating systems were better designed as was seat comfort. The doors now had side windows in one piece, which go all the way down, and were electrically powered. Side visibility was therefore much better than on the Countach, also because at the front of the doors, the window-line dipped down to allow a better viewing of the external mirrors. In fact this dip of the front door is regarded by many as the most beautiful region of the car -- sadly not reproduced in the most recent Murciélago (see below). The total number of Lamborghini Diablo's built over the years is probably 1000-1200 cars. When Audi took over Lamborghini in the late 90's already a lot of work had been put into thinking about a successor. Earlier designs were really extensions of the Diablo. Known as the L147 project during its development. The L147 had many features in common with the VT 6.0. except it had large air scoops at the rear. Apparently Audi did not like these designs and redrew the whole cars shape. The resulting Murciélago car was shown at the factory in Italy in September 2001. The 'Murciélago' name (as for the Miura, and Diablo) was taken from names used in bullfighting. During a Spanish bull fight in 1879, a now legendary bull by this name was still standing after 24 stabs from the 'espada', (the matador's sword). The animal apparently was spared. As to the overall design of the car. Response has been mixed. Some feel the design was too conservative while others like it and rave about its comfort and drive ability. The styling of the Murciélago could be seen as an evolution of the Diablo 6.0 model, but it is clearly visible that this car had a very clean design with a highly professional look. The design featured very angular lines, especially at the front, combined with magnificent curves with various air intakes and outlets to cool the massive brakes and a fabulous new V12 engine. Some complain of the air scoops for the rear brakes which seem to be 'stuck on' rather than part of the car. This may be corrected in later editions. All agree the car is more impressive in real life than in photographs. The new engine was designed with power output now up to 600 bhp. One unique feature to the car is that when conditions require it, the rear air intakes actually open up about 20 degrees to allow more air into the engine compartment, the intake surface is increased by no less than 80 percent. Most of the time the intakes will only be raised when the car is at rest or driving slowly because at speed the intakes are sufficient in their lowered position. The positioning is fully automatic, although a dashboard mounted button can also raise them. The intakes would automatically open when the engine temperature rose above normal operating levels or when the outside temperature was above 32C, also once the speed of the car reaches 125 mph where air intake is not a problem they close. The engine in the Murciélago was still closely related to the famous V12 t of the Countach and Diablo, but now used the latest technology in motor design. A dry sump lubrication was used on this 6.2 liter engine. This allowed the engine to be lowered a full 2 inches in the chassis, improving the weight ratio and road holding ability of the car. The gear box has been increased from 5 to 6 speeds. A special system was installed to limit wheel spin when accelerating fast, also the self blocking differentials (VT system) introduced in the Diablo were still used, 25% at the front axle, while 75% was used at the rear, a further development of the ABS system also seen on the Diablo has been integrated into the Murciélago. A new design 18 inch set of wheels was incorporated into the design. These wheels used a special design to maximize the cooling effect of the disc brakes. The tire size at the front was slightly enlarged compared to the Diablo, while the rear wheels were still covered with the massive 335/30 ZR 18 Pirelli's P Zero 'Rosso' tiers. As for the later Diablo's, the nose of the car can be raised about 2 inches when driving over speed bumps or when driving up a steep sloop. An adjustable rear wing spoiler also raises itself at high speed. The spoiler is completely flush with the bodywork until the car reaches about 65 MPH at which time it tilts up about 50 degrees. Above 110 MPH it flips up further to 70 degrees. This gives the car plenty of down-force for stable driving up to its maximum speed of about 210 MPH. The interior of the Murciélago was also extensively redesigned. The dashboard no longer has the unique sloping curves of the later Diablo's. In fact it has a central panel more like the early Diablo's. Returned also is the passenger grab handle of the early Diablo's, but now it is on the left hand side by the gear shift as in the Miura's. There is much more headroom. The seats adjust better and the foot pedals are much better placed to be directly in front of the driver. The Alpine navigational system is still optional however. The doors still open upwards but now a little better. In February 2006 Lamborghini presented next evolution of the Lamborghini Murciélago Coupe at the 76th International Car Show in Geneva which they call the Murciélago LP640, which refers to its engine position - longitudinal posteriore - and to its power 640 HP. Designers and engineers have not only focused on reworking the engine, suspensions, gearbox, exhaust system, brakes and electronics, but also the interior and exterior design. The Murciélago LP640 now appears even more aggressive, with the new front and rear bumpers contributing significantly to its appearance. The exhaust system terminal has been incorporated in the diffuser on the rear bumper. Other innovations include the rear lights, which enhance the distinguishing features of the Murciélago LP640, making it unmistakable even at night. The design of the sides is also worth mentioning: while the area behind the air intake on the right side is practically closed, the left side features a vast aperture for cooling the oil radiator. The engine of the new Murciélago LP640 has undergone a radical modification. The increased bore and longer stroke have boosted the displacement of the classic 60-degree V-engine from 6.2 liters to 6.5 liters (6,496 cm). Thus the 580 hp engine power has now been elevated to an impressive peak of 640 hp at 8000 RPM. The 12-cylinder engine reaches a maximum torque of 660 Nm at 6000 RPM. More power and higher torque call for superior gearbox component performance. To meet these new demands, the new Murciélago LP640 features a modified six ratio gearbox as well as a tougher rear differential and new axle shafts. On request, the e-gear automatic gearbox is also available equipped with the new dedicated 'Thrust' (acceleration program) mode. Just like its predecessors, the Murciélago LP640 features permanent four-wheel drive, based on the reliable Lamborghini VT (Viscous Traction) system. The system is self-governing and does not feature any electronic controls. The drive force is usually divided between the front and rear axles in the ratio of 30 to 70. An independent control circuit adjusts the distribution of the drive force depending on dynamic oscillation, weight distribution and the relative friction factor in perfect synchronization with the Visco clutch. In extreme cases, up to 100% of the drive force can be applied to a single axle. Driving, handling and stability at high speed are enhanced by new springs and stabilizers, as well as by a redesigned electronically controlled damper. The 'anti-dive' and 'anti-squat' features on the axles, which efficiently prevent so-called 'brake diving' and 'squatting', have not been changed. The two springs on every rear wheel, the single spring on every front wheel and the damper are placed coaxially. The new aluminum 'Hermera' rims measure 8.5 x 18 inch (fore carriage) and 13 x 18 inch (rear axle). The vehicle can be fitted with various sized Pirelli P Zero 'Rosso' tires. The Murciélago LP640 features 245/35 ZR 18 front tires and 335/30 ZR 18 rear tires. For sports use, especially on racetracks, Lamborghini provides optional Pirelli P Zero 'Corsa' (Race) tires. Pirelli P 'Sottozero' (Sub zero) winter tires are also available. The dual hydraulic circuit brake system equipped with a vacuum brake booster ensures considerable deceleration values. The self-ventilating front and rear brake disks measure 380 mm x 34 mm and 355 mm x 32 mm respectively. The control circuit of the four-channel anti-blocking system (ABS) with electronic brake control (DRP) and traction control (TCS) features a new characteristic curve. The system consists in an electro-hydraulic control unit and four speed sensors. When particularly high braking performance is required, on request it is possible to equip the vehicle with 380 mm x 36 mm ceramic carbon brakes featuring six-piston brake calipers. Thus, less pressure needs to be applied to the brake pedal and the braking distance is reduced. Even in extremely demanding conditions there is almost no perceptible fading. Considerably reduced weight and superior lifetime represent two further advantages, as well as a captivating graphic design. However the car does not have the Gallardo like "stability control system" (ESP) to assist the driver in very demanding conditions. The seats in the cockpit have undergone radical changes also. More spacious and equipped with redesigned head restraints, the seats now ensure better comfort. The leather upholstery features lozenge-shaped stitching called 'Q-citura'. The same design is recaptured on the upholstery on the door panels, the panel between the seats and the engine compartment, and on the roof panel. A new instrument panel has been developed with lights featuring a new graphic design, flanked by a new Kenwood car radio with a 6.5inch widescreen monitor, DVD, MP3 and WMA player. An optional Eclipse based navigation system is also available. For further details and specifications on the Murciélago click here. This is the newest member of the Lamborghini family. It was first shown at the Geneva International car show in March 6-10, 2003. It is a smaller version of the Murciélago, keeping the signature front view of that car. The engine is a 10 cylinder DOHC four valve V10 (90 degree), 5 liter, 500 HP, torque 510 Nm (more recent models are now up to 520 HP). The engine is mounted under an optional transparent cover. The 90 degree angle of the V12 allows for a lower overall car height. The car is capable of reaching a top speed of about 185 MPH. List price in the US was about $170,000 in 2003. Current prices start around $210,000. The 'Gallardo' name (as for the Miura, Diablo and Murciélago) was taken from the world of bull fighting. Gallardo is the name or a breed of Spanish fighting bull first used in bullfighting in Spain in the 1800's. Historically, these bulls have enjoyed a well-deserved fame of being the most beautiful specimen within the race. The styling of the Gallardo is quite refreshing, somewhat angular and odd shaped in some places, but quite unique to previous Lamborghini cars. The signature image of the car I think will be its forward leaning side view mirrors. These tend to create an impression of motion, when looking at the Gallardo from the side. The front of the Gallardo is similar to the Murciélago, with the same basic shape of the air intakes in a massive bumper/spoiler combination. There are large side air inlets that start on the doors and cut into the bodywork to allow fresh air into the engine. I think in fact that these are more integrated into the overall car than those of the Murciélago where they seem to stuck on as a kind of after thought. Disappointedly the doors on this Lamborghini open in the traditional way not upwards as for its close relatives. A real disappointment! As is currently the trend, wheel size has been enlarged to 19 inches all round. The interior of the Gallardo is clean, very functional and finished in the finest materials - mainly leather. An optional "paddle shifter" or "E-gear" as Lamborghini calls it, eliminates the need for a gearshift lever on the central console. This racing style F1 shifter consists of two levers behind the steering wheel to control the sequential gearbox. You can also get the car with a standard 6 speed gearbox. The braking system, features a state of the art ABS/ESP system along with a full "stability control system" (ESP) to assist the driver in demanding conditions, while still allowing a true sports driving experience. The actual brakes consist of 365mm front and 335mm rear disks using Brembo 8-piston calipers in the front and 4-piston calipers in the rear. The Gallardo, Lamborghini claims exceeds all current European and North American safety standards. Besides the normal driver's and passenger's 'dual stage' front airbags, there are side 'head-thorax' side airbags and door anti-intrusion bars. In September 2005 Lamborghini introduced the Gallardo SE at the IAA car show in Frankfurt. A total production of only 250 units was planned. The car has a high gloss black (Nero Octis) roof which contrast heavily with both the yellow or white bodywork. The Gallardo SE has a two-tone interior, all piping and stitching on the premium quality leather is executed in the same color as the bodywork of the car. Also the black floor mats have color coded borders. There are Lamborghini shields on the headrests and the script on the dashboard. There is a rear view camera system integrated into the back spoiler. There is an upgraded multimedia system as well. However the navigation system is still optional. A sport suspension and an exclusive engine cover also come with the car. The e-Gear, which features a 'thrust' mode to offer even more impressive acceleration by improving the gear change through the different gears. With the modified engine now delivering 520 Bhp at 8000 RPM, it only takes 4 seconds flat to reach 60MPH and the top speed of ~190 MPH. In March of 2007 Lamborghini introduced the Gallardo Superlegger at the Geneva Auto show. Lamborghini removed about 200 lbs of weight from the standard Gallardo. By tweaking the engine timing and modifying the muffler and air intakes the horsepower has been raised to 530HP. To achieve such a weight loss a lot of parts on the standard Gallardo have been replaced. These include the inner door panels - which are now finished in clear Carbon Fiber. The seats are no longer electrically adjustable. The engine cover on the Superleggera has been replaced by a clear Carbon Fiber unit featuring a light weight Polycarbonate transparent section. Even the windscreen has been made thinner to further reduce weight. The exterior rear view mirrors are also finished in Carbon Fiber and the rear bumper now also features a clear Carbon Fiber lower section as are the lower side sills. For further details and specifications on the Gallardo click here. In hopes to keep this wonderful site running and keep John Monahan's work around for everyone to benefit from, Lamboweb.com was transfered to Jason Jones (owner of Bullstuff.com) in 2014 to continue to maintain and update while John has "retired" from the website. If you have a technical question please use our forum.